Everything you ever wanted to know about grapes: where they’re from, how they’re grown, and recipes for cooking with them. Don’t miss the superfood spotlight on grapes! Grapes, the fruit revered by the ancients. Humans have been enjoying grapes since the dawn of civilization and even today they are one of the most cultivated crops in the world. Grapes are the the fruit we reserve for picking and snacking. We love bunches of grapes on the table during dinner parties, on platters, in fruit salads, and even alone as a simple snack on the go. But have you ever stopped to think a bit deeper about grapes? 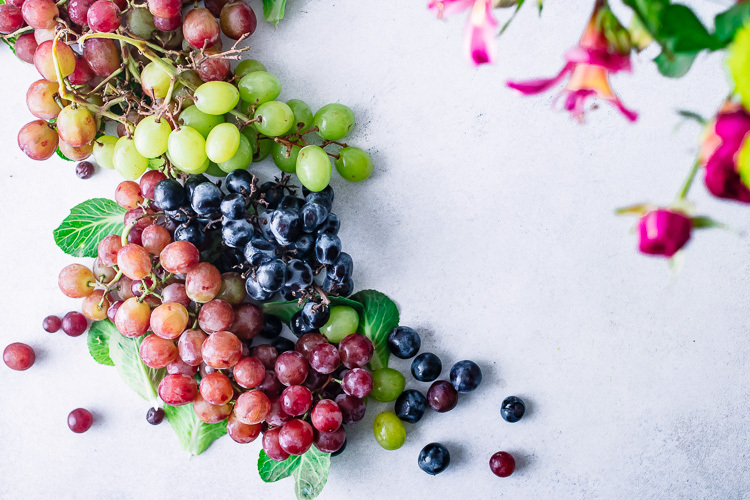 This superfood spotlight dives deep into where grapes are from, how they are grown, their health benefits, and all of the ways you take grapes from a simple fresh snack to a delicious part of an inspired meal. Let’s do it! Grapes are botanically considered small berries as they are a fleshy stone-less fruit that grows from one flower, or vine. Grapes grow in clusters of 60-300, can be eaten fresh from the vine, and have many culinary uses. They can be mashed and mixed as jams and jellies, fermented into vinegar and wine, dried into raisins, or expressed into grapseed oil. Grapes have a long and varied role in many cultures through history going back to ancient times. The first known cultivators of grapes are thought to be the in the Neolithic Era around 6500 B.C. in what is today Western China. Over time grape cultivation, and by extension wine-making, made its way through Asia Minor, the Middle East, and into Egypt by 4000 B.C. Grapes have a long and interesting place in human history dating back to ancient times. Grapes were a staple throughout the rise and fall of both Ancient Greece and Rome, however after the fall of the Roman Empire grape cultivation in Europe was mainly kept alive by monasteries. After the Renaissance grapes, and wine in general, became a part of the social fabric of many European cultures including Spain, Italy, France, Greece, and Turkey (source). Where are grapes grown? When are they in season? Grapes are grown throughout the world in mild, temperate climate but most are found in the Northern Hemisphere along coastal areas with fertile soil. They begin sprouting in the spring and are ready to harvest in late summer and early fall. According to the Food and Agriculture Organization, 76,000 square miles of the world’s surface is dedicated to grape cultivation, with more than 80% of that for the production of wine. The countries that produce the most grapes and wine are Spain, France, Italy, Turkey, United States, Iran, Romania, Portugal, Argentina, and Australia, however grape cultivation in countries like Chile, China, India, and South American is quickly picking up speed. Grape vines are perennial plants, meaning that they will produce fruit year after year throughout their lifecycle, however most vines do not start producing substantial (or tasty) fruit until their third year of life.. Most grape vines live to be about 25 years, however if left to their own devices (without the intervention of humans interested in making their grapes into wine) vines can live to 100 years and beyond. The reported oldest known grapevine is said to be 400 years (it even holds a Guinness World Record) and is located in Austria. [mks_pullquote align=”right” width=”300″ size=”24″ bg_color=”#000000″ txt_color=”#ffffff”]The grapes you and I know and love today are much different than those of the past, as they have been selected to be sweeter. Wild grapes grow throughout the world, even in the United States, and are sour, mealy, and more acidic. [/mks_pullquote] A big conversation in the grape growers community, especially that in the winemakers of Northern California, is sustainable grape cultivation. The industry as a whole is exploring the sustainability of their crop and evaluating how conserve water, mitigate soil erosion, and and protect air quality in the regions they’re grown. Interested in learning more about the cultivation of grapes? Check out this interesting article by Winefolly with grape lifecycle animations. Concord: arguably the world’s most common table grape, Concord grapes are dark blue or purple in color. They are grown throughout the world but are mostly found the Northern United States and Canada and are what traditional grape juice is made from. Flame Seedless: commonly known as “red grapes,” Flame Seedless are red, sweet, and have a long growing season. They are actually a hybrid variety made European varieties, but are mostly grown within the United States. Grapes are actually a berry. Grapefruit received its name by the Portuguese in Barbados because they grow in clusters (on trees) like grapes. But no relation. Wine was such an integral part of historical civilizations because the wine fermentation process killed bacteria and caused less sickness than drinking contaminated water. Grapes come in many colors including black, blue, purple, red, pink, yellow, and green. “White” grapes are actually green grapes with less and all grapes get their color from the amount of the anthocyanin that they contain. Raisins are grapes that have been dried and without the moisture they become much denser nutritionally. A cup of raisins is about 490 calories and contains 11 grams of fiber, however they are also much higher in sugar per gram than fresh grapes. Raisins are a nutrition powerhouse but, like other dried fruit, they’re best consumed in moderation. 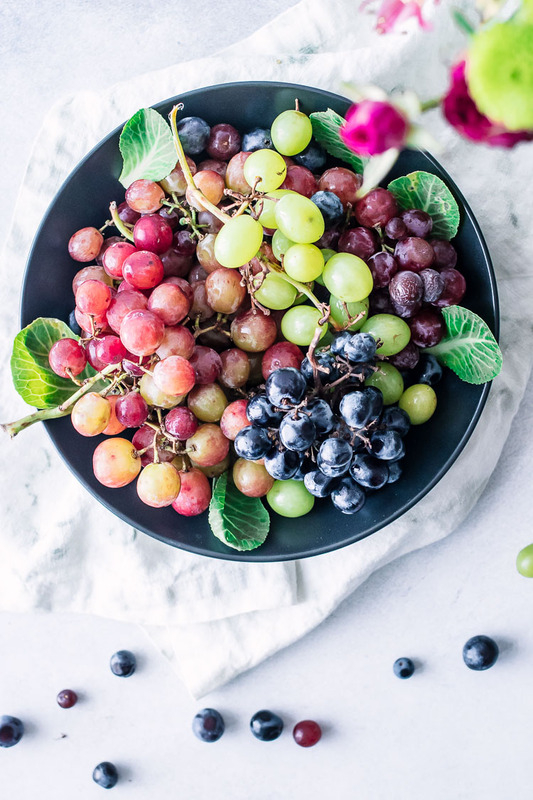 Grapes contain polyphenols called flavonoids, which act as antioxidants in your body by becoming a “clean up crew” ridding your cells of free radicals that cause cell damage. 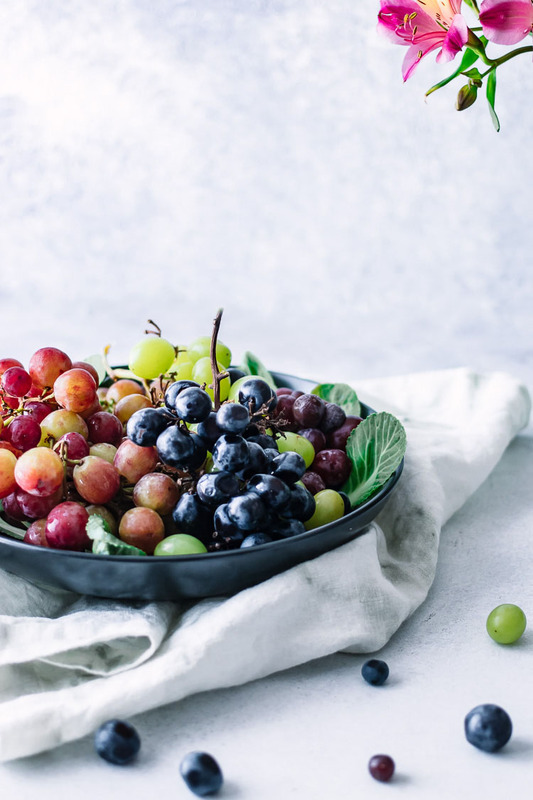 Vitamins, minerals, and other compounds act as antioxidants in the body and support cell health; vitamin C, vitamin K, and manganese are just some of the antioxidants found in grapes. 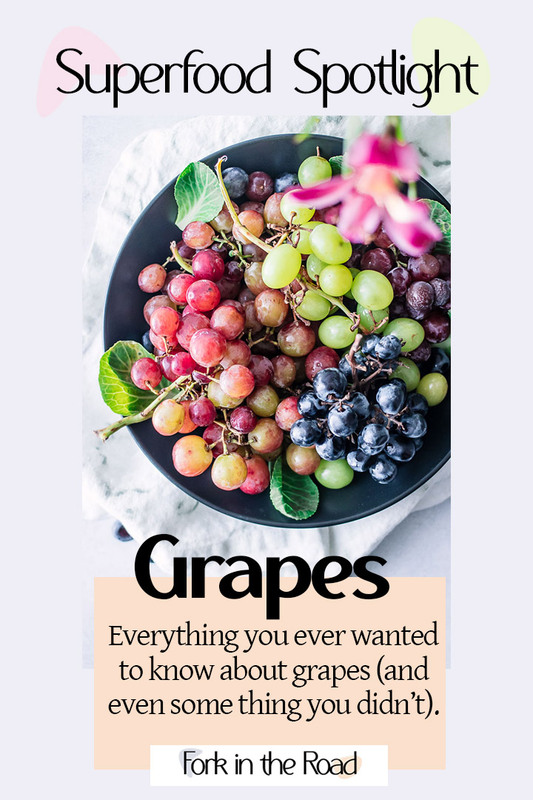 [mks_pullquote align=”left” width=”300″ size=”24″ bg_color=”#000000″ txt_color=”#ffffff”]Because of grapes high beneficial nutrient and antioxidant amounts, it’s safe to say that they are a “superfood.”[/mks_pullquote]Grapes’ contain the antioxidant resveratrol, a phenolic compounds also found in berries and peanuts. Resveratrol gets a lot of hype in health media because research has shown that it may be heart healthy. Some studies suggest it may help to lower blood pressure, may play a role in lessening the effects of cholesterol in blood, and lead to longer lifespans in animal studies. However, it is important to note that the research has not been replicated in humans and that the amounts of resveratrol tested were very high (source). 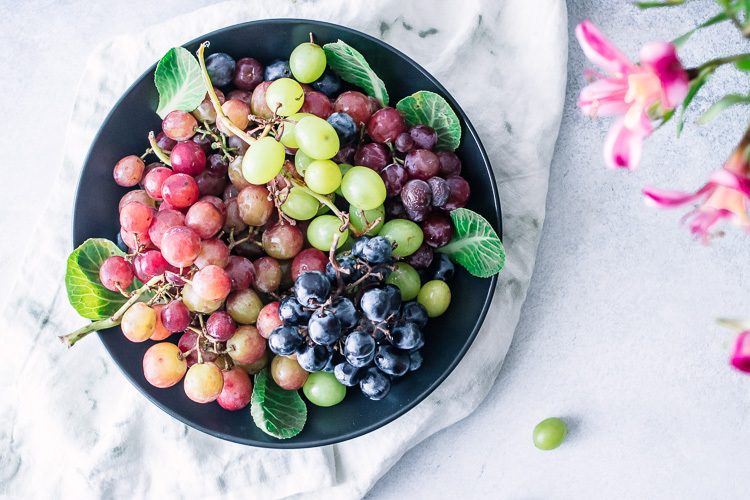 Because of grapes high beneficial nutrient and antioxidant amounts, it’s safe to say that they are a “superfood.” However, realize that all foods–including grapes–fit into a healthy and balanced diet. Here at Fork in the Road we spotlight and celebrate all foods. See our take on superfoods here. Grape season hits its peak in late summer and are harvest through mid-fall, usually late August through October in the northern hemisphere and February through April in the southern hemisphere. The freshest grapes are plump and sweet and can be enjoyed for longer than their season by canning in jams, preserves, and by freezing (we freeze grapes in the fall each year and eat as snacks all winter!). Grapes are a healthy and delicious fruit that can be incorporated into your culinary creations in so many ways. 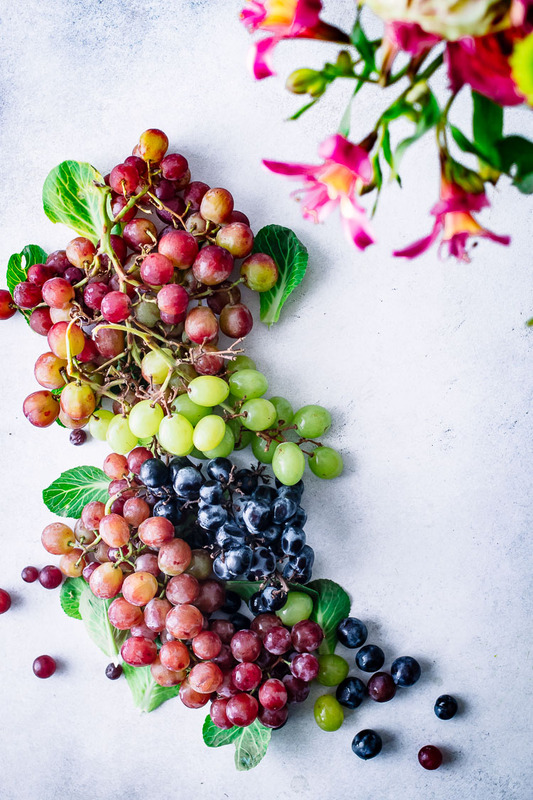 I would love to hear YOUR favorite way to enjoy grapes, leave a comment below and let me know your favorite way to incorporate them into your meals. Enjoy grape season! I love grapes! They are one of my favorite snacks in the summer. Me too, I love seeing the colorful bunches at the market. My favorite time of year for produce!